There is a real advantage in ‘really’ knowing a location. Knowing it so well you can look at the sky an hour before and pre-visualise the end result. This is the story behind this image. Narrowneck ridge juts out in a north to south direction below Katoomba in the Blue Mountains. 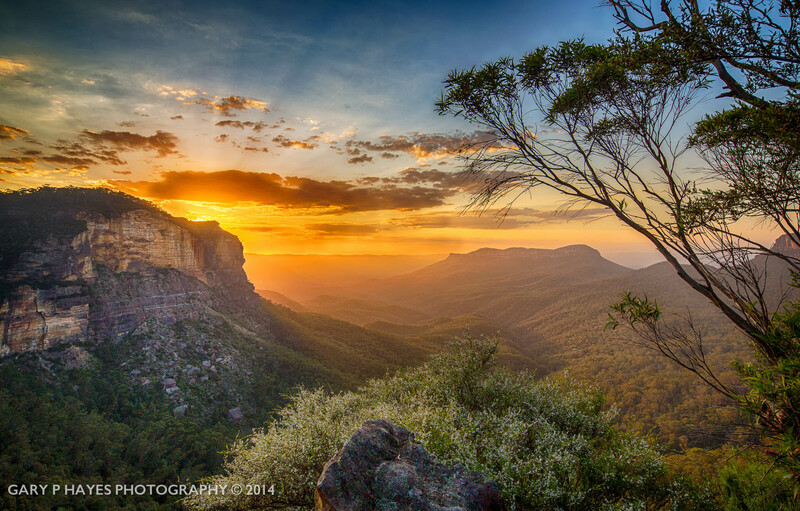 This makes it one of the few places in the area to get bona fide sunrises and sunsets off either side of it – most of the other lookouts between Wentworth Falls and Katoomba face south. In my Blue Mountains photo guide I have linked to a detailed map of the ridge and 5 or 6 of the key lookouts. But one morning in February I wanted to avoid facing the sun full on after it had risen and was trying to think of a viewpoint from Narrowneck that would provide a nice ‘block’ so I could get some richness and better light balance IF there was some low lying cloud. So the morning arrived. I looked out of the window at home at Wentworth falls pre-dawn and saw a nice cloudbank to the east. I quickly checked on my Android TPE app and suncalc.net for the precise angle of the sun and the best lookout. I knew of a hidden outcrop which I called 1a, quite close to a place to park near the top of the ridge and setup and waited. This is a very small and wild lookout, no fences and a straight 100m drop all around it so as well as being careful with tripod placement I had to work hard to get any decent foreground. So I mounted the tripod lower than I would have liked but also with my 17mm shift lens I shifted it down 6mm or so. I put the 0.9 graduate neutral density Wonderpana filter on to drop the sky light a few stops and waited. I took a few shots pre sunrise and just afterwards but it still didn’t have the intensity I was after. I knew I would need to wait just before the sun popped it’s head over the ridge. Then an almighty crack. What was that? I spotted a parachute descending over the rocks below landslide ridge. A base jumper / paraglider had just done his thing. I watched spellbound and worried for his safety as he landed behind a large rock at the bottom, then almost simultaneously the sun rays sprayed out above the ridge. Click. Got it. Checked my zebra for blown out highlights, a couple of small ones, so I took a second two stops darker. This is the one I used and without blending I pulled up the shadows and tweaked the vibrance slightly on the raw file to end up with this hopefully, as true to being there as possible. The picture works I think because of the leading lines in the valley, the lovely warm light coming around the corner in the distance and those rays crowning the scene. It captures that timeless energy that many dawn mountains pictures have, especially as those rocks from the landslide have been there a lifetime (since 1930s) along with a joy (fueled by the base jumper), a sense of life is precious and short.